St Valentine's Day was followed by Valencia's night at Parkhead as yet another attempt by Celtic to chart a path into the later stages of Europe foundered, in this case on the shoals of their own errors, which were punished by sucker punches on each side of the interval. There should have been no surprise that Denis Cheryshev, the predatory Russian striker, would be on the scoresheet for the first goal conceded by Celtic in 2019 but the latitude afforded to him and his fellow scorer, Ruben Sobrino, was essentially suicidal. 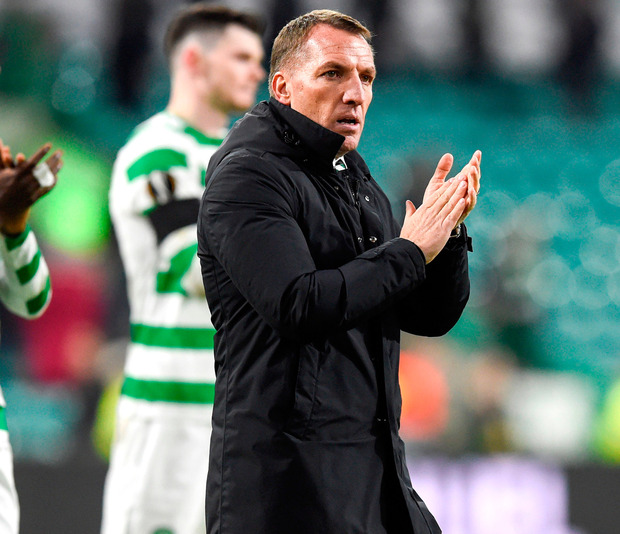 Brendan Rodgers had urged his players to believe that they were as good as their fancied opponents but this display was proof that, given current resources, even the Hoops manager's powers of persuasion have their limits, too. The dismay of yet another capacity crowd in the east end of Glasgow was in inverse proportion to the fervour displayed beforehand. The build-up was turbocharged and for the first few minutes Celtic were able to fuel the bedlam, with a mass howl for a penalty when James Forrest went down in a challenge from Toni Lato but the claim was founded on thin evidence and duly dismissed. More substantial was the chance that fell to Callum McGregor when he wormed through the middle of the Valencia defence for a shot which Neto did well to block. The goalkeeper had to be on his game again 10 minutes before the break when Celtic produced their best move of the first half, as McGregor won possession deep in his own territory and slipped a pass to Scott Sinclair who shuttled it on behind the Valencia backline ahead of Burke, only for Neto to beat him to the ball with a slide clearance on the edge of the box. It was McGregor, though, who was ambushed for the breakthrough in the 42nd minute as Valencia switched play to Sobrino for a simple pass across the box and an equally tidy finish by Cheryshev. If that was a sickener, the second half promptly provided another when Celtic's defence evaporated to permit a cross from Cheryshev to be side-footed home by Sobrino. Rodgers attempted to prise a degree of hope from the contest with a double substitution midway through the second half, with the introduction of Timothy Weah and Odsonne Edoaurd but neither was able to alter an anti-climactic night for the home fans.